Adult fishing bald eagle with wide open wings split second away from catching a salmon along the British Columbia coast off Vancouver Island, Canada. One of the biggest challenges for a wildlife photographer is to photograph a fishing bald eagle (Haliaeetus leucocephalus) from a moving boat. Even that I'm shooting eagles for many years now, I'm always happy to get a shot just in the right moment of action and honestly, with all experience, great equipment, auto focus and and and, it still requires beside the skill of the craft a little bit of luck to make it perfect. In this photo the bald eagle is a split second away to catch a salmon, wings wide open and talons ready to catch. 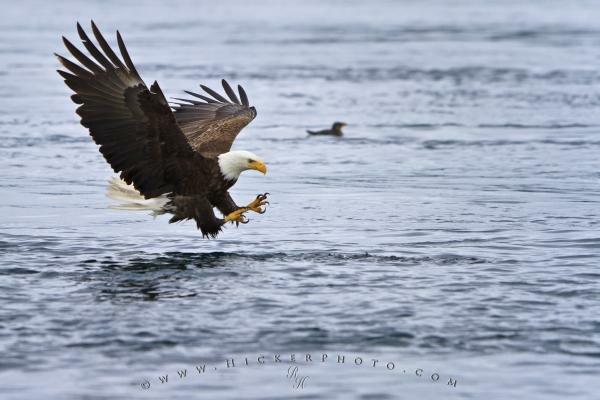 Photo of a fishing bald eagle just before catching a fish off the Vancouver Island coast. ... always a trade one way or the other, I sure risked to loose the picture because of light motion blur but on the other side ISO 800 is simply not satisfying to me, no matter that everybody says the Canon D7 has "no grain", it is way better then ever before but for me ISO 800 is unusable. My pictures often are bought for trade shows which they want to blow up to 10 feet. 400 is the most I ever use but avoided if somehow possible. We (Pete, "my captain" and I) were actually out photographing bears this day when we saw some eagles from the distance fishing in this rip tide, I think I had 3 times the chance to photograph this action scene but I think that this one here is the best from this fishing bald eagle series. I like the angle in which the eagle comes in, it shows beautifully the underside of the wings. I prefer to be as low to the water as possible, this means I normally go out in a smaller boat. I'm also happy that it is a "good looking eagle" - sorry, don't get that wrong but bald eagles can be dirty or bloody at times and it can easily ruin the shot! We often see bald eagles fishing on my private photo tours I offer around and from Vancouver Island North (contact me if you coming this way! ), it is a bonus to the other wildlife like bears, sea otters, orca and humpback whales we normally photograph. Fishing bald eagle with wings wide open just before catching a fish, in the background swims a Rhinoceros Auklet, Broughton Archipelago, Vancouver Island, British Columbia, Canada. Please check out my photo gallery of Bald Eagle Pictures which I just updated with some new photos. I photographed this photo with the digital SLR camera model Canon EOS 7D, aperture of f/4.0, exposure time of 1/1600 sec. on ISO 400, as always I used a original Canon Lens, the focus lenght for this picture was 300mm.